Dharam Ghopee and Barons Finance. End of the road? A few days ago, I posted an order made by HHJ Mackie QC in the Mercantile Court in July 2013 in relation to Mr Dharam Prakash Ghopee. I have now received a copy of a further order by HHJ Mackie QC, made on 29 January 2014. A copy is below. 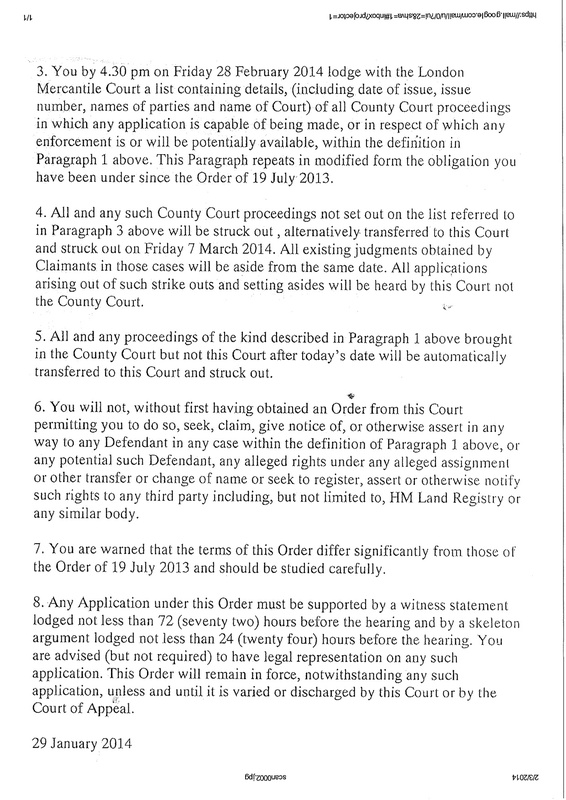 It is clear from the additions to this version of the order that HHJ Mackie is not satisfied that Mr Ghopee has complied with the earlier order to cease all county court actions in respect of ‘loans’ made by Mr Ghopee’s companies and to transfer those matters to the Mercantile Court. This version of the order puts it beyond doubt. 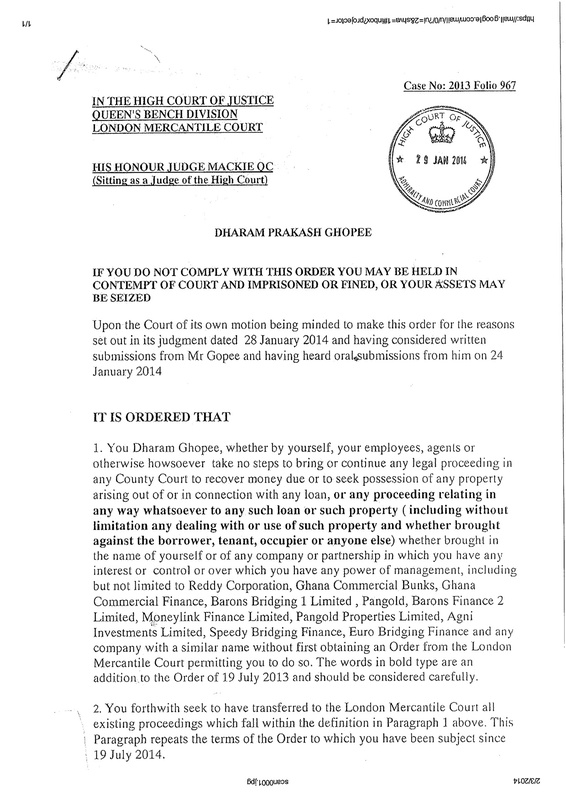 Any proceedings at all by Mr Ghopee or any of his companies, named or not named in the order, arising out of or in connection with a loan, are to be transferred to the Mercantile Court. No proceedings may be issued or pursued without the express permission of the Mercantile Court. Any such proceedings not notified to the Mercantile Court by Mr Ghopee by 28 February 2014 will be automatically struck out, with all existing orders in those proceedings set aside. Lest there be any doubt, this means that Mr Ghopee is in very great trouble indeed with the Mercantile Court. Anyone who knows of County Court proceedings being pursued by Mr Ghopee or any of his companies should make that Court aware of the orders of HHJ Mackie QC. In particular paragraphs 4 and 5 of this latest order. RESULT! Only took (at least) 15 years.